Bad Breath? Visit Your Waco Dentist for Halitosis Help! Did you know your bad breath may be trying to signal something to you—that you have other health concerns! Bad breath, formally known as halitosis, is a common dental problem that may be cause for concern. There are many reasons why you may be experiencing chronic bad breath. Your Waco dentist figures if you can figure the reasons, we can help patients realize the sooner you treat it the sooner you’ll have improved breath and oral health. We all know that if you skip parts of your dental hygiene routine, your smile will become weaker but it is also the main cause of bad breath. When food particles remain on the surfaces and crevices of your mouth, the bacteria that then forms carries an overpowering odor. Harmful bacteria can get trapped on the surface of your tongue, between teeth, at the gum line, and on and between dental prosthetics. Having a dry mouth all the time can also cause your breath to smell unpleasant. Since one of saliva’s purposes is to clean your mouth, a decrease in saliva means particles and bacteria can be left behind. Aside from chronic dry mouth, this can also be caused by certain medications, drinking alcohol or smoking, and even snoring. Sleeping with your mouth open also tends to dry out the mouth. Not limited to smoking, any use of tobacco can lead to halitosis. Oral tobacco can leave particles on the mouth’s surface just like cigarettes. Also, the scent of cigarette smoke can sit inside your lungs for several hours, making the breath stale. 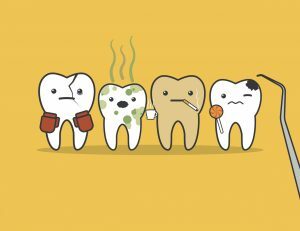 Tobacco also dries out your mouth creating a breeding ground for gum disease and bad breath. More informally known as advanced gum disease, periodontal disease can have serious health consequences—even causing patients to lose their teeth. Bad breath can be an early sign of this disease. Bacteria in plaque builds up in the initial stages of gum disease, causing your breath to smell less than inviting. The condition can have many causes, but if left untreated, the tiny spots between teeth and gums can become infected. Bad breath shouldn’t ever be something you have to deal with consistently. There are several things you can do to keep your mouth smelling fresh. Brushing twice daily (don’t forget your tongue!) with fluoride toothpaste followed by flossing will help remove the odor-causing dental bacteria. Mouthwashes that contain cetylpyridinium chloride can also cut down the smell of bad breath. Drinking plenty of water will also promote saliva production and remove particles from the surfaces of your mouth. Chew sugar-free gum to keep your natural saliva flowing. If you use tobacco, quitting can be the best start to fresher breath. Dr. Cofer Can Help You! One of the best ways to handle bad breath is by visiting Premier Family Dental regularly. We not only perform routine oral exams and thorough professional teeth cleanings, we provide complete dental care to help patients with issues that could be causing their bad breath. Unpleasant breath does not have to control your life! Contact us today to schedule your next appointment. Comments Off on Bad Breath? Visit Your Waco Dentist for Halitosis Help!